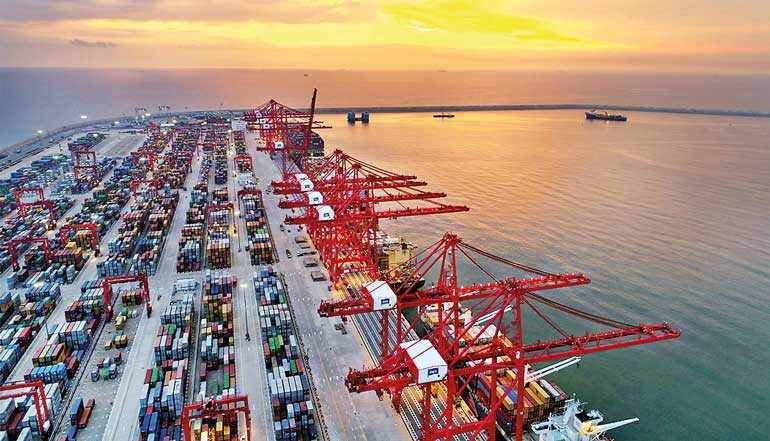 Colombo, April 9: The Colombo International Container Terminals (CICT) in which the China Merchants Port Holdings Company Limited is a partner, has reported handling 2.65 million teus for the 12 months ending 31st December 2018, recording a 13 percent increase in its annual throughput and contributing 38 percent of the Port of Colombo’s volumes in the year just concluded. A significant factor in the achievement of 7 million teus by the Port of Colombo, CICT’s performance helped the port increase its total throughput by 14 percent in 2018, a noteworthy accomplishment in the region. Announcing the year’s final volume, CICT said ULCCs (Ultra Large Container Carriers) of a size that only CICT is capable of handling, had contributed 70 percent to the volumes the Terminal achieved for the year. CICT handles mega container vessels from all three major shipping line alliances. With the geographical coverage of these services and the high frequency of mainline liner service connections, CICT has helped the Port of Colombo to move up the Drewry’s Port Connectivity Index to be ranked the 11th best-connected port in the world. The concluded year has been a prolific one for CICT: besides being adjudged the Best Container Terminal in Asia in the Under 4 million teus at the Asian Freight, Logistics and Supply Chain (AFLAS) Awards for the second consecutive year, CICT also handled MV. Ever Golden, the first 20,000+ teu vessel of Evergreen to call on Colombo, as well as the 14,000 teu ‘One Columba’ – the first magenta colour vessel to call on Colombo. The company was also responsible for salvaging the storm-ravaged ‘MV Theseus’ earlier in the year. In its engagements with the community in 2018, CICT continued to be the principal sponsor of the SLTA’s wheelchair tennis programme, was the strategic partner of the National Chamber of Exports initiative to develop local exporters, and won the softball cricket tournament organised by the Chamber of Commerce. CICT recently also announced the addition of two new mega Quay Gantry Cranes (QGCs), six new Rubber-tyred Gantry Cranes (RTGs) and 12 Prime Movers to enable the handling of 22,000+ teu vessels and further develop the deepwater capacity of the Port of Colombo. This enhancement is planned for completion by March 2019. Besides its significant contributions to the growth of the Port of Colombo in volume terms, CICT is also responsible for several firsts in service innovation and eco-friendly operations. In early 2016, the company launched a US$ 10 million programme to convert its fleet of diesel operated rubber-tyred-gantry cranes to electricity driven rubber-tyred gantry cranes (E-RTGs) which have zero carbon emissions. CICT is the first and currently the only deep-water terminal in South Asia equipped with facilities to handle the largest vessels afloat. Since its inception in 2014, the terminal has incrementally grown the volume it has handled; from 686,639 teus in 2014, to 1,561,931 teus in 2015, 2,002,580 teus in 2016, and 2,388,506 teus in 2017. In its last four full years of operation, CICT has brought some of the largest vessels plying the Asia-Europe routes to Colombo. Of these, Milan Maersk (20,568 TEU), MSC Maya (19,224 TEU), Mogens Maersk (18,300 TEU), MSC New York (16,652 TEU), CMA CGM Marco Polo (16,020 TEU), Edith Maersk and EMC Thalassa Hellas (each 14,000 plus TEUs) and their sister vessels are now regular callers at CICT.